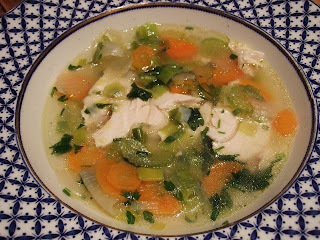 My husband's not been feeling too good the last few days - some strange bug that's made him feel a bit queasy - so I decided to make him some boiled chicken. How unappetising does that sound - or indeed look? You have to say there are no comparisons between the colour and aroma of a roast chicken and the slightly pallid, slithery looking appearance of a poached one. Get over that, however and you've got yourself a feast. 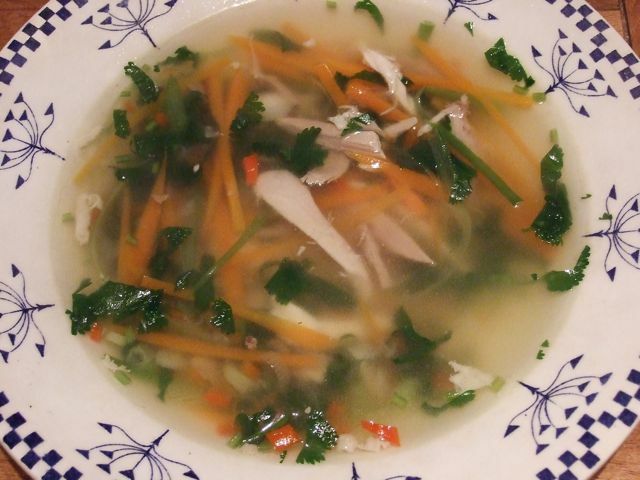 I covered the chicken - a basic free-range one from Tesco (oops, sorry, but it's been hectic this week) - with water, added a cut onion, two carrots, a bayleaf and a few white peppercorns, brought it to the boil, skimmed it then put it in the Aga simmering oven for about 50 minutes. Breast side downwards for the first 20 minutes then I flipped it over. You can obviously do it without an Aga but don't let it boil. The cooking liquid should barely tremble. I cut up a leek, two more carrots and a stick of celery and put them in a shallow pan with a teaspoon of bouillon powder and a ladleful of the chicken stock and half-boiled/half-steamed them, adding extra ladles of stock as the stock evaporated until the veg were just cooked. I prefer that to putting them in the cooking liquid as they they get too soggy. Once they were done I added about half the remaining chicken stock, fished out the onion, sliced it and added it to the veg and chucked in a handful of parsley. 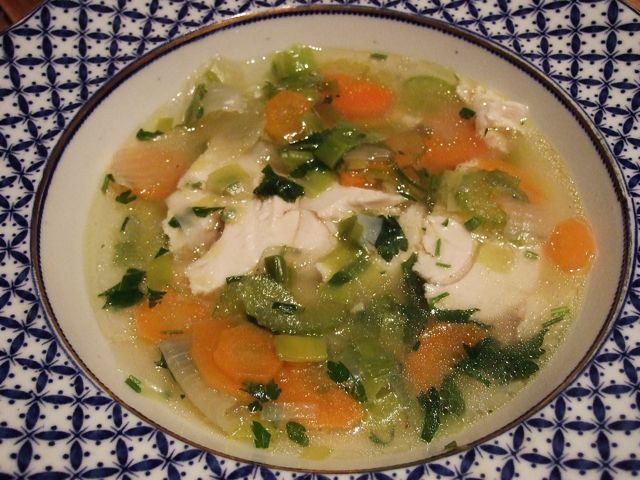 I took one of the breasts off the chicken and cut it thickly on the slant, put the slices in two shallow bowls and spooned over the fresh veg and stock. Meal one which would have made four portions (or seconds if we'd been hungrier). Last night I skimmed the rest of the stock and added a finely grated chunk of ginger, a large grated clove of garlic, a small red chilli, some finely sliced coriander stalks and a finely sliced spring onion brought it to the boil, seasoned it with a little soy sauce and set it aside to infuse. Finally I chopped the meat from the other leg up finely, added a finely sliced spring onion and stick of celery, a dollop of mayo, a bit of chopped parsley and a squeeze of lemon and voilà a sandwich filling for two large sandwiches. So from one five pound(ish) chicken (£5.35 actually) I got 10 servings which isn't bad. You get less shrinkage from boiling a chicken, more moistness and certainly better flavour for these kind of dishes. And perfect food if you're not feeling 100%! I love this kind of cooking. Thank you for sharing! Also, that has to be the best looking chicken sandwich I have seen in a long time. 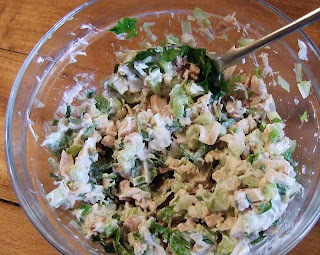 Hmmm, this might solve a couple of kitchen dilemmas I've been pondering--how to make a more substantial, main-course meal of chicken soup, and how to make my chicken salad more moist without glopping on ever more mayo. Thanks! I love cooking a whole chicken in the slow cooker, in water, with a bit of onion, carrot and maybe a bay leaf. I leave it on for hours and have to be very careful lifting it out as it's so moist and tender it will all fall apart at the slightest provocation. I am not a huge fan of broth soups so we keep the stock aside for use in risottos. And I even put the carcass back into the slow cooker for another stock overnight - I thought, the first time I tried it, the second stock would surely be insipid, but that's not the case at all! Love sandwiches Lisa. Any excuse . . .
All I used was one heaped tablespoon of mayo Roving Lemon. 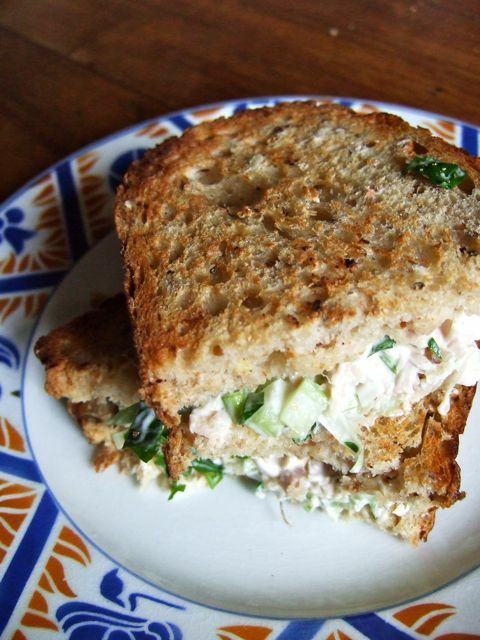 So you could say it was a healthy sandwich filling. Almost . . .
Also very good in the slow cooker Kavey. I've tried that. Although not double cooking it. That IS frugal! Clearly I'm outclasses in the howmanymealsyoucangetoutofonechicken stakes TrillianAstra. Never mess with Mumsnet! Have you tried a boiler chicken? They're old egg layers. They look really scrawny, are far from free range, but a good way to make the most out of the poor things. I haven't tried it yet, but our local market sells them really cheap so I must give it a go one day. Since my first poached chicken, I've never done them any other way. Although I have to say, that to combat the "been left in the bath too long" look, I do give mine a quick toasting in a hot oven. Just enough to brown the skin, which also adds glorious flavour to the ensuing stock. Boiled chicken always used to be done with tough old boilers, Clare but they're quite hard to track down these days. Should work though you might need to cook them a little longer than a roasting chicken. Haven't tried browning the skin on a poached chicken Jenny but I guess that might work. I just remove the skin - one of the other advantages of this method is that it makes the skin less tempting! Which three recipes would you pass on?